What Wondrous Love is This? A Franciscan Perspective on Holy Week and Easter. Ever since this past Sunday (Palm Sunday) as I have been reflecting on the great mysteries of Holy Week the words to the folk hymn, What Wondrous Love is this?, now often sung in Catholic parishes during Lent, kept coming to mind. The question raised by the title became the overarching theme of my own personal meditation and guided the homily that I preached for the friars here in St. Petersburg on Holy Thursday. Ever since the middle ages there has been a Christian obsession with the bloody details of Jesus' Passion and Death and with that came the evoking of guilt due to our sin being the cause of that. Now I'm not suggesting that the sin of humanity did not cause the suffering of Jesus, but rather refocusing on what the mystery of the Cross ought to evoke in us. In our Franciscan theological tradition Jesus did not come to get punished. He came to love us. We hold that it was the plan of God from the beginning to be united with God's creation even if we had not sinned. The sources for this in Scripture are to be found especially in chapter one of John's Gospel and in the canticle in the Letter to the Collosians. The friars did not "invent" this approach but rather made it popular. It has its roots in the early Church fathers as well. Now there's no denying that Jesus was punished, that He bore the weight of human sin, but His mission from the Father was to come in love and proclaim the Reign of God. He was rejected in His attempt to carry out this mission and instead of withdrawing from us or lashing out in anger He continued to love us. Real love always brings about suffering and Jesus' was no exception. St. John in Chapter 13 of his Gospel tells that "He loved his own in the world and He loved them to the end." What then is to be our reaction? Yes, we ought acknowledge our sin, but not by way of some big guilt trip, rather by opening our hearts in humble faith and trusting that in His great love our merciful and loving Lord wants to enter even the darkest recesses of our souls to heal us and make us new. In me this evokes deep, heartfelt gratitude. When Peter, again in John 13, resists Jesus attempt to wash his feet he is told, "unless I wash you you will have no inheritance with me." What Jesus means by this is "Unless I pour all of my love into you you cannot be my follower or disciple." 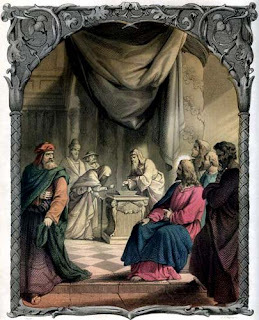 As Pope Benedict XVI tells us in his commentary on this gospel text in Volume II of his Jesus of Nazareth, the foot washing is a "Sacrament" of the entire mystery of Jesus Passion and Death. From the Cross Jesus' love is poured into all of us who open our hearts to Him. Have we all surrendered totally to that love? I know that I have not, but that is the challenge. I am,like most if not all of us, on the way. So, my friends, on this Holy Saturday as we prepare to celebrate the Resurrection let us open our hearts to such a Wondrous love and allow ourselves to be transformed by it. That is the real goal of the Christian life. Serving the Poor, A Challenge for Deomocrats, Republicans and all of us. Over the past two weeks I think that all of us have been moved by the humility of Pope Francis and by his genuine concern for the poor. 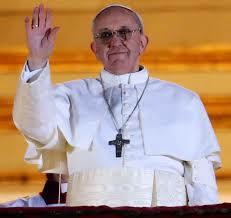 He has expressed a desire to have a Church for the poor and of the poor. How does this translate into our everyday lives? I am a Franciscan and delighted by the fact that a Jesuit Pope has taken the name Francis, but I am also challenged by that fact. It makes me want to be a better Franciscan and to simplify my life even more. The initials OFM after my name stand for Order of Friars Minor. Even knowing that the term Friars Minor is not clear to everyone. The minores (as opposed to the maiores) at the time of Francis were not only the very poor, but all those who were excluded from power, who had no say in things. That included ordinary small merchants as well as lepers and beggars, all who were outsiders, as it were. Francis wanted to be among the minores and above all let them know that they were not on the outside with God or with him and his fellow friars. This should tell us the first thing that we need to know about serving the poor. That service begins by being among them and knowing and understanding their struggles. Pope Francis, as Cardinal Archbishop of Buenos Aires did just that. He did things like taking the bus to work. He talked with people. He came to understand their struggles and to see things from the point of view of the ordinary person. I think back on my own life and realize that I have been at my best when I have been among the people, be it in the North End of Boston, mid-town Manhattan, Buffalo, NY, Camden NJ and so many of the places where I have preached parish missions. What poor people and ordinary working people are looking for first of all is a sense that they matter, that they are not forgotten. Yes they need and want our financial help and other assistance as well at times, but if they don't think that people form the Church or from their government, etc. (in any country) know how to walk with them and understand their struggles then anything else that is offered seems awkward, foolish or off the mark. I try to stay away from political commentary on this blog, but in this case I believe that a challenge can be sent to both political parties. Republicans really do need to connect with the poor and make sure that while budget cuts are necessary they should not be made on the backs of the poor. Giving the impression that everyone who takes money form the government is a moocher and freeloader is not the way to go. Yes, there are freeloaders, but most of the excess spending is not because of that, but because of abuses within the system of delivery of services within medicare, Social Security (which people have paid into) and other government programs. I am also upset when I go on Facebook and see requests to drug test every welfare recipient. Welfare recipients should be treated like everyone else. If there is reason to drug test them, fine, but don't subject all of them to this. If you have ever talked with a family that is working at two underpaid jobs and trying to make ends meet you would clearly understand this. And what about Democrats? You too have to learn to walk with the ordinary people. Many government programs are inefficient and encumbered by bureaucratic red tape. When poor folks seek help they may in fact get money, food or whatever, but they often feel degraded in the process. Democrats these days are often accused of being socialists. That is giving them too much credit. Most of them are just taking money from different lobbyists than the Republicans and then try to make the poor and the middle class think that they are working for them. Maybe some of the Democratic and Republican Congress people could try riding the bus to work and simply listening to what the ordinary folks have to say. In recent years our Catholic sisters have come under scrutiny for some of the things they have undertaken, but I believe that they, above all in the Church, are walking with the poor and the marginalized. We would do well to follow their example. Finally, lest I be charged with hypocrisy, I am making some cuts and simplifications in my own lifestyle and am looking for ways to better listen and spend time with the many ordinary folks that I serve as I go about preaching. After a week of hectic travel I am at St. Michael's Church in Crowley, LA, to begin a parish mission. On Wednesday afternoon I was gathered with the pastor and the parish staff at Jesus, Our Risen Savior, in Spartanburg, SC when the TV showed white smoke emerging from the chimney at the Vatican. An hour later came the good news, " Gaudium magnum annuncio vobis,Habemus Papam." The real stunner came a moment later when his name was announced--Franciscus, Francis. I myself wondered if it might be Francis Xavier since the new pope is a Jesuit, but no, it is indeed Francis of Assisi after whom he is named. I have always sort of joked that the perfect Catholic has a Jesuit mind with a Franciscan heart, and this is what we have in Pope Francis. Many are asking about the kind of changes that he might make in terms of several hot button issues. As understandable as that is I have always felt that a change in the way of doing business in the Church must precede any other change and I believe that this is what we will see with Pope Francis. His humility and simplicity are already rubbing off on those around him, and in my case are causing me to have a good look at my own life in terms of these qualities and I hope that we might all do that and not just point to the hierarchy and their need for reform, which is certainly there as well. 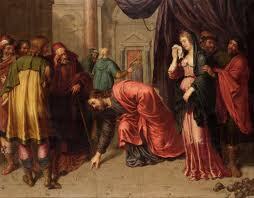 This leads me to segue into a reflection on this Sunday's Gospel, the well-known story of the woman taken in adultery. (Jn 8:1-11). We all know the story. The authorities want her stoned according to Jewish law. Jesus speaks the well known words, "Let the one who is without sin cast the first stone." He then writes on the ground and the crowd flees. What is Jesus doing? Several things. First, he is showing that sin is overcome foremost by forgiveness, not punishment, not by throwing stones. Second, he is confronting the crowd and us to look at our own sins. Third, while we may be afraid that He will turn and throw stones at us, He forgives us as well. And what does this have to do with Pope Francis. Besides the humility and simplicity that he shows I think he is asking us to stop throwing stones at each other and to work together as one. That was the tone of his opening remarks from the balcony--"Bishop and people together." We have our differences indeed, and they must be dealt with, but not by name-calling and rancor, but by walking together in the footsteps of Jesus. We are arriving at the middle of Lent and the Sunday that the Church calls "Laetare" or rejoicing Sunday. We are reminded as we do penance that the purpose of the penance is to be ready to not only celebrate the great feast of the Resurrection, but to be embraced by the Risen One. 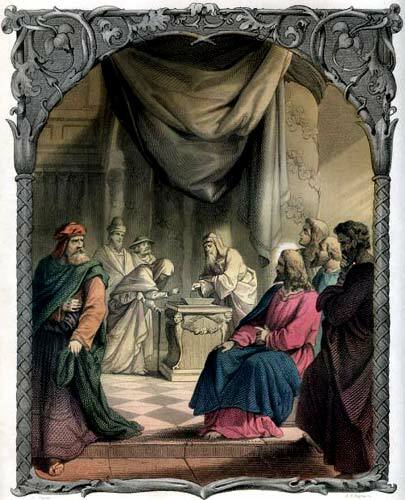 This year's readings on Sundays are from cycle C which features the Gospel of Luke and the Gospel text is the well-known, but not always well understood, Parable of the Prodigal Son, a story that Pope Benedict XVI, in the first volume of his Jesus of Nazareth series, calls the parable of the Good Father. There is good reason for this because the two sons in the story are very typical. It is the Father (God the Father) who stands out. 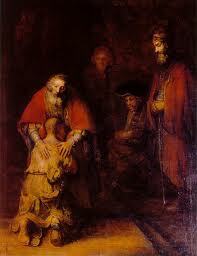 When the younger Son begins to return we are told that the Father "ran to his son, embraced him and kissed him." (Lk 15:20). We have heard this story so often that we take that action for granted, but the first hearers of this parable at the time of Jesus would have been astounded, shocked or even scandalized. A father at that time would have been expected to wait at home and have the son come begging to him. This son had squandered his inheritance and was working with swine. Remember, this is a Jewish family. Working with swine made him unclean. The son thinks that he can no longer be a son. just a hired worker. The father then astounds us more by putting a fine robe on him, a ring on his finger and sandals on his feet. (Lk 15:22). These gestures tell us that the boy is no hired worker, but a son again. Wow. Over the years both within the confines of the confessional and outside of it I have encountered people who thought that their sin had permanently cut them off from God. They make statements like, "I'm hopeless father, you don't want the likes of me." I always tell them that not only I, but most importantly our God, wants them back. In fact like this son, even when we begin to turn back to God, God is already running out to meet us. The Sacrament of Reconciliation is where we get the robe, the ring and the sandals. Unfortunately too many of us are like the older son, the prodigal who stayed at home, whose obedience is resentful and who is full of self-righteousness. There are too many people today who are focused on who should be thrown out of the Church than on how to draw people closer to Christ. So, let us rejoice this Sunday as we priests appear decked out in rose-colored vestments rather than dark purple one. Let us seek and celebrate the wonderful, astounding mercy of our God, and let us rejoice when someone returns to our God. Remember, they killed a fattened calf for the occasion (Lk 15:23) Animals were not killed just for one family in those days with no refrigeration. When an animal was slaughtered it was so that the whole community could rejoice together. What a wonderful message to have before us in this week when the cardinals will most likely elect our next Pope.